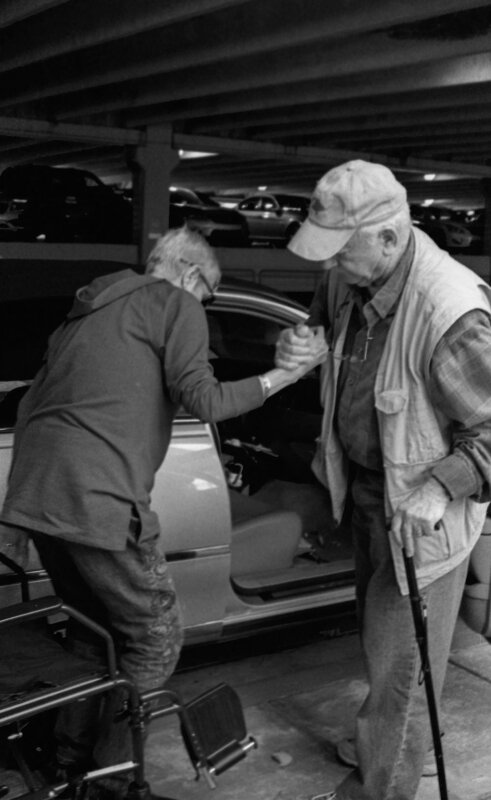 Esther has been living with chronic pain and illness for decades and George has been by her side every step of the way, taking on the role of caregiver in more recent years. I began documenting their life together in the fall of 2017 in an effort to memorialize their love through photographs. This desire to preserve their legacy for my family’s current and future generations became a personal project spanning the course of several months. Esther developed pleurisy as a result of gallbladder removal surgery in December 2017. She was hospitalized in January 2018 for treatment. Antibiotics to treat the surgical side effects sent her into kidney failure and left her in a lethargic state. Esther died in hospice care on January 20, 2018. She is survived by her husband of 53 years, George, 3 daughters, 4 siblings, 11 grandchildren and 1 great-grandson. George Cloud, Hartley Smith and Layna Smith visit Esther Cloud at Wellstar Douglas Hospital in Douglasville, Georgia, on January 14, 2018. Hartley Smith visits her grandmother, Esther Cloud, at Wellstar Douglas Hospital in Douglasville, Georgia, on January 14, 2018. 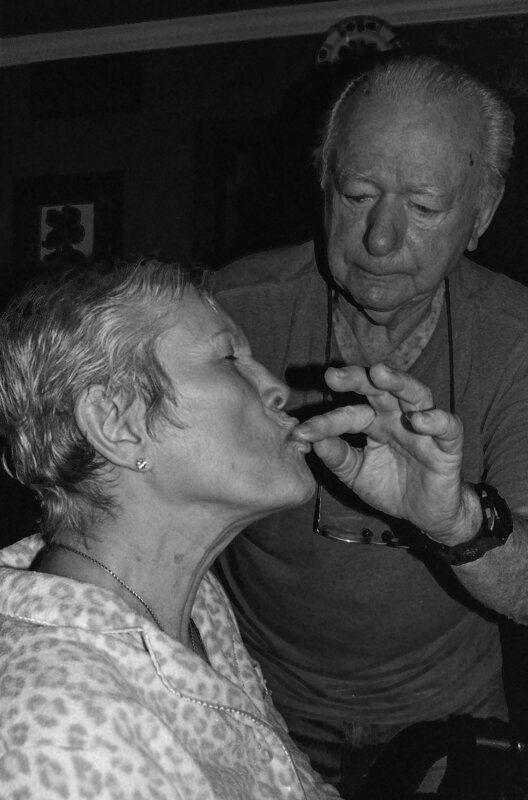 Leslie Hilderbrand strokes her mother Esther Cloud's forehead at at Wellstar Douglas Hospital in Douglasville, Georgia, on January 14, 2018. Melanie Hilderbrand embraces Hartley Smith while visiting Esther Cloud at Wellstar Douglas Hospital in Douglasville, Georgia, on January 14, 2018. Pearson Smith sits in her grandmother Esther Cloud's room at Wellstar Douglas Hospital in Douglasville, Georgia, on January 14, 2018. George Cloud speaks with nurses at Wellstar Douglas Hospital in Douglasville, Georgia, on January 14, 2018. George Cloud sits in his wife Esther Cloud's room at Wellstar Douglas Hospital in Douglasville, Georgia, on January 15, 2018. Lawson Beauchamp kisses his grandmother, Esther Cloud, at Wellstar Douglas Hospital in Douglasville, Georgia, on January 14, 2018. Esther Cloud's daughter, Leslie Hilderbrandk and granddaughter, Hartley Smith, feed Cloud at Wellstar Douglas Hospital in Douglasville, Georgia, on January 15, 2018. Layna Smith holds her mother Esther Cloud's hand at Wellstar Douglas Hospital in Douglasville, Georgia, on January 14, 2018. 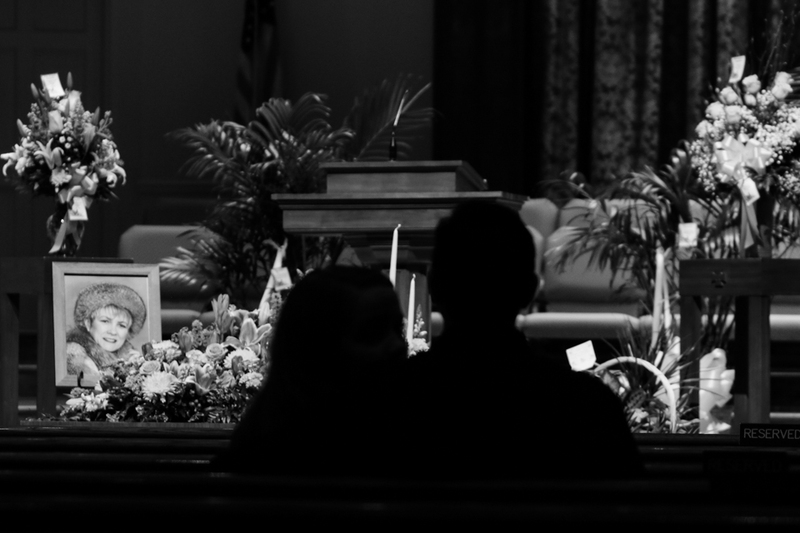 Hannah Hinson and her boyfriend attend Esther Cloud's funeral service at Lithia Springs First Baptist Church in Lithia Springs, Georgia, on January 27, 2018. Since the death of his wife, Esther, George now spends most of his time keeping busy at home in Lithia Springs, Georgia, and caring for his dog Molly. George Cloud prepares a snack for himself in his home in Lithia Springs, Georgia, on February 9, 2018. George Cloud gets dressed for the day in Lithia Springs, Georgia, on March 10, 2018. Cloud wears his favorite shirt, the one his wife Esther gifted him for Christmas 2017, one month before her passing. 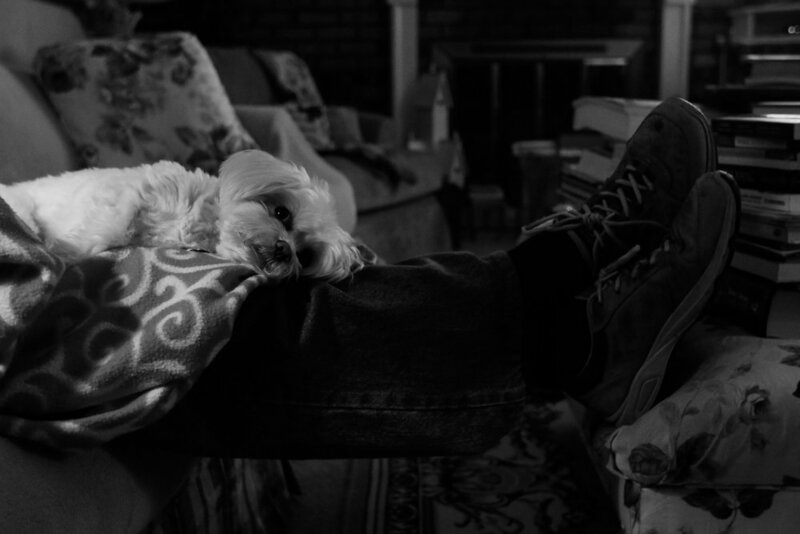 Molly rests on George Cloud’s legs in Lithia Springs, Georgia, on February 9, 2018. George Cloud walks his dog Molly outside his home in Lithia Springs, Georgia, on February 10, 2018. George Cloud plays online checkers in his home in Lithia Springs, Georgia, on February 10, 2018. George Cloud visits his wife Esther Cloud's gravesite at Mozely Memorial Gardens in Lithia Springs, Georgia, on March 10, 2018. George and Esther were married 53 years when she passed away in January 2018. George Cloud drives in Lithia Springs, Georgia, with Molly in his lap on Friday, September 28, 2018. George Cloud eats breakfast in his favorite booth at Waffle House in Lithia Springs, Georgia, on Thursday, September 13, 2018. “I just love sitting here and watching the world wake up,” Cloud said. September 11, 2018, marked his 54th wedding anniversary to wife Esther and his first as a widower following her passing in January 2018.